Japan’s Hiroki Okada, 19-0, faced the popular vet Raymundo Beltran, 35-8-1, in a scheduled 10 round junior welterweight affair at the Save Mart Center in Fresno, California on a Sunday night card aired live on ESPN. The first round was close, but Okada was landing more effectively. Beltran sent his man to the mat in the second, courtesy of a mean left. Okada got up on an eight count and didn’t appear badly hurt. Yet, in the final minute of the round, it was Beltran who got rocked by an Okada right. Beltran seemed to be getting an edge heading to the halfway mark. Okada, however, looked a bit sharper than Beltran in the 6th. Okada continued to impress in the seventh, courtesy of a sharp jab and effective use of range. The fight continued on at a relatively exciting pace. In the ninth, however, things ended in explosive fashion. Beltran dropped his man once, but Okada got up. Beltran dropped him again..and referee Jack Reiss wisely stopped the match. Jose Zepeda walked into the ring a short time later. The 30-1 fighter was facing the 23-0 Jose Ramiez for the WBC junior welterweight title in a scheduled 12 round affair. The southpaw Zepeda boxed quite effectively in the first, sticking and moving and keeping the champion Ramirez from landing hard. Zepeda was able to slick his way through the second, as well. The California native was adhering to an effective game plan. A more aggressive Ramirez seemed to edge the third, though the round could have gone either way. Being a home town fight for Ramirez, one had to assume any round that wasn’t completely dominated by Zepeda might well go to Ramirez. Ramirez started the fourth very well, but Zepeda took the last portion. The fifth saw Ramirez have his moment, but Zepeda’s effective game plan ended up telling the tale. By the end of the sixth, it was clear that the first half of the bout was a story of ring generalship, where Zepeda employed footwork to dominate his foe. 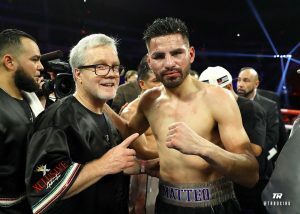 Ramirez was ale to get back in the fight in the seventh, as his punches began to land on a lackadaisical seeming Zepeda. Ramirez was able to land on his man very effectively in the eighth. The ninth saw Ramirez throw the more effective shots again. The fight had become quite close. Zepeda came back and asserted his skill set in the 10th. An exhausted Zepeda took the 11th. A vicious Ramirez took the 12th in a finally rally. The judges gave the win to hometown fighter Ramirez by scores of 114-114, 115-113, 116-112.